Biologische Imkerei - der Weg zurück copyright 1991 - 2016 by Ed and Dee Lusby. Zu eurer Information habe ich versucht das Buch seit Jahrzehnten zu veröffentlichen und nun wird es für den Unterricht von sauberer ökologischer Imkerei, für Workshops, Lehrvereine, Schulen, Universitäten, Colleges und Imker im Allgemeinen verwendet werden können. 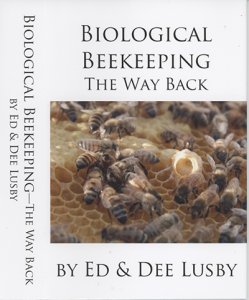 Biological Beekeeping - The Way Back,...copyright 1991 - 2016 by Ed and Dee Lusby. All rights reserved. No part of this book may be reproduced or transmitted in any form or by any means without written permission of the author. This is to let you know that the book been trying to formally publish for decades is now done for teaching clean organic beekeeping, that can be used for workshops, clubs teaching, schools, universities, colleges, and beekeepers in general. Michael Bush got it done for me and should be ready shortly for buying/ordering. With luck it will be available at the upcoming 2 - 4 March 2018 .........11th annual Organic Beekeepers Conference in Oracle, Arizona with him bringing first available copies for getting. Other then that it will be avail within 6 to 8 weeks for buying on Amazon, Barnes & Nobel, and others, if not sooner. So more and more the conference is coming together...So come on out to Arizona for a great weekend. Wenn Sie nicht über Ed und Dee Lusby, über kleinzellige Bienenzucht, über biologische Imkerei und ihre nachhaltigen Imkerei-Techniken wissen, dann haben Sie entweder nicht aufgepasst, oder Sie müssen irgendwo unter einem Felsen gelebt haben. If you don’t know about Ed and Dee Lusby, small cell beekeeping, biological beekeeping and their sustainable beekeeping techniques, then you haven’t been paying attention, or you’ve been living under a rock somewhere. 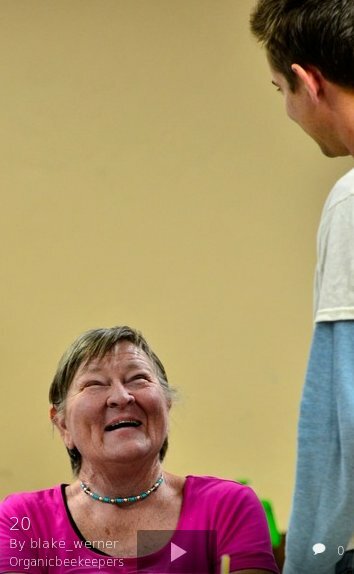 Although Ed passed several years ago, Dee and her followers have kept up their practices of making small cell foundation, recycling beeswax, natural breeding for resistant bees, and actually, healthier bees that survive without chemical insults and make honey. The first third of this book is what they have done and how they have done it. The remainder is the supporting current and historical data that convinced them to begin these practices. Dadant, Root and the USDA are cited often in this section. There are a score of articles they have published, and that have been published on their work here also, some of them from Bee Culture over the years. I toured beeyards in Arizona with them some time ago, and have published articles on their story of success using small cell beekeeping. If you’re not familiar with the small cell story it goes something like this. In their natural state, that is living in the wild, honey bees construct comb with cells about 4.9 mm wide or so. Decades ago, beekeeping companies undertook it to produce bigger bees, using foundation with comb about 5.5 mm or so. These larger bees, it was thought, could fly further, carry more and work harder. It’s not clear that this happened, however. But because they were bigger they had longer tongues and were able to forage on flowers smaller bees could not forage on. At least that’s what the foundation companies said. Little effort was made to return to smaller bees. This belief continued, basically, until Varroa entered the picture, and the Lusby’s and others looked and decided that a smaller, natural sized cell would accommodate fewer, if any female mites to reproduce more mites. Moreover, these smaller bees emerged sooner than their larger cousins thus reducing further mite reproduction, and thus mite control was simplified.